The owners and leaders of the company are technology subject-matter experts and nationally recognized solutions engagement professionals. With unrivaled brand recognition, marquee clients, technology expertise, massive project capabilities and an expansive business case portfolio, our client is projecting remarkable 5-year growth. Building on a well-established local, regional and national footprint, the company has not only increased revenue by more than 100% over the past 3 years but is projecting year-to-year growth exceeding 20% over the next 5 years. 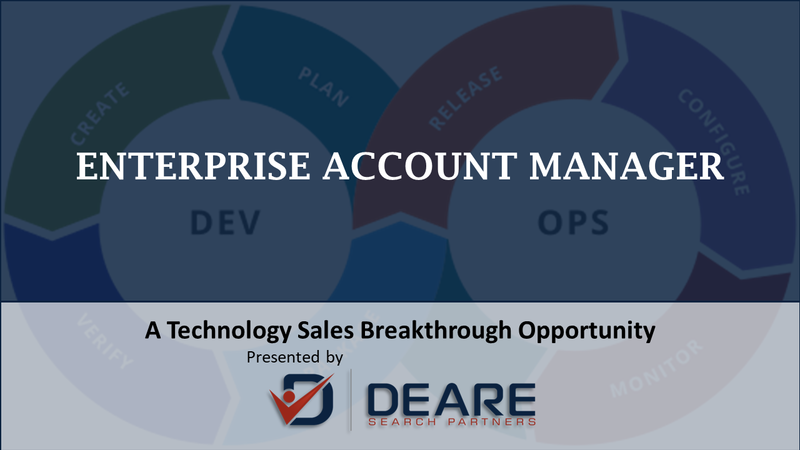 The Enterprise Account Manager (EAM) position is a sales role involving continuous expansion of business and relationships within existing accounts and a strategic, results-focused new business development effort. The EAM will work with high-priority “Major” and “Growth” accounts to discover and exploit project, solutions and other business opportunities. While the salary target is $100,000, no specific limitation has been set. Qualified, higher salaried sales professionals are encouraged to explore this opportunity.